I am attaching a wonderful letter from Lesley and Steve Hooper who spent two months with the project – I just know you will enjoy it, we are very grateful to them for their time and hard work, so generously given. We have been at Meg Foundation for 2 months. It is our first time staying here although not our first time in Rwanda! 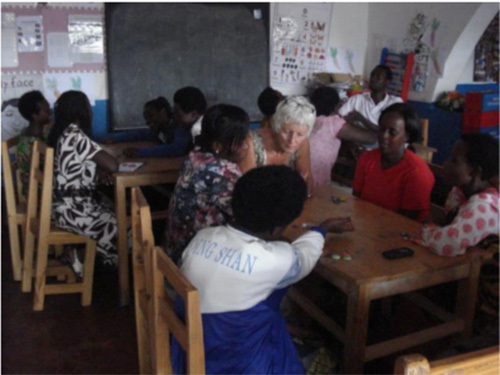 We volunteered with VSO 2011 – 2013, working with teachers in a district outside of Kigali. We met Meg, wanted to return to Rwanda and what better way than to be able to support the Foundation as well as visiting special friends and places. AMAZI YAGIYE! Water has gone! Water – or lack of it – has been on everyone’s minds here. We have had 4 or 5 days a week without running water and the effects are considerable, not only at Meg Foundation but in the neighbourhood. 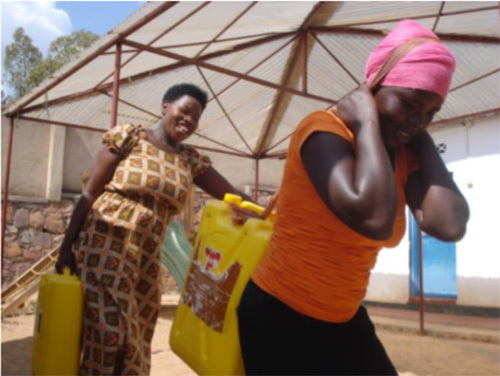 Long queues form throughout the day as people go to water points with their yellow jerry cans. The situation was so desperate last week with our stored supply having almost run out that the teachers took the decision to go and bring back water. Off they set, with a jerry can each to fill and bring back. Three times they went off, having filled large buckets, bowls, and saucepans to replenish the supply. This ensured that the children could have porridge and lunch the next day. The best thing about our time here has been working with the teachers and seeing how willing they are to take on board new ideas. They are already well trained in how to organize the children for all sorts of different activities, but it is ideas they need and want. Leaf prints, using dressing-ups to enhance story- telling, play in a “home corner”, reading and re-reading stories to the children so they know them well and can act them out, making books, new parachute games, obstacle course, planning group play activities, have all been introduced or re-introduced to the Nursery Teachers. Sessions for Primary classes have become more interesting for both students and teachers now that they are following a timetable. We have shared some different ideas with them: graphs using weather data, still life drawing of flowers, dice games, maths activities using dominoes, making English work into a class book, using a “shop”, looking at atlases; simple ideas to enhance and enrich the teaching and learning. We brought out many gifts from some of the sponsors who support children at Meg Foundation. Other parcels have arrived by post. 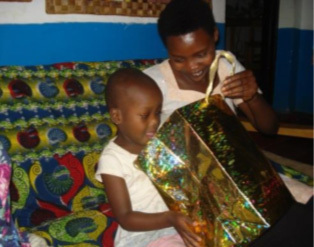 It is always such a highlight for the child and their mother when they are called to receive their gift and be photographed, so the sponsor can receive the photo. A little girl in P1 was recently bereaved. Her father had been ill and he died one Tuesday night. The next morning, the school took the decision that the school would close early to allow the teachers to go to the funeral. There is no time lapse between the death and the funeral which means the family has no time to come to terms with the death before the burial. A simple church service and the interment at a burial ground in one of the poorer neighbourhoods in the city were followed by mourners returning to the family home to show their support for the family. A few days later, the classmates from the little girl’s class all brought “ijana” (10 pence each) and they set off down the dusty hill to her home. They squeezed into the tiny house and after praying for her and singing they presented her with the money they had raised to help her family. Life and death sit side by side here in a more obvious way than in developed countries. Twice a week the school reverberates to singing and music as Leontine and Regine come to run regular music lessons. 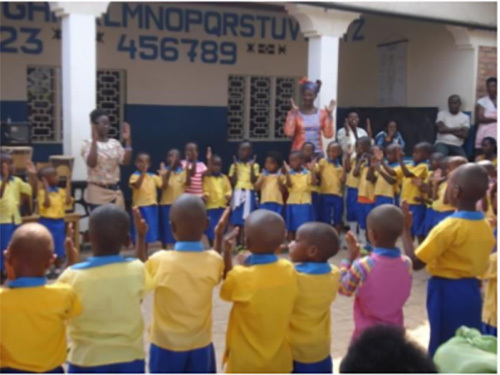 We can ALL sing by heart the lovely ikinyarwanda song they wrote themselves and have taught the children. These two young musicians have been trained by a small NGO in good nursery/primary methodology and the lessons they deliver are spot on! The children and the teachers love the sessions and we are so pleased there is funding to continue to the end of Term 3 (November 2015). Term 2, ended with a wonderful assembly. Parents came, all the school gathered in their bright yellow and blue uniforms in the school courtyard and we enjoyed a great celebration. 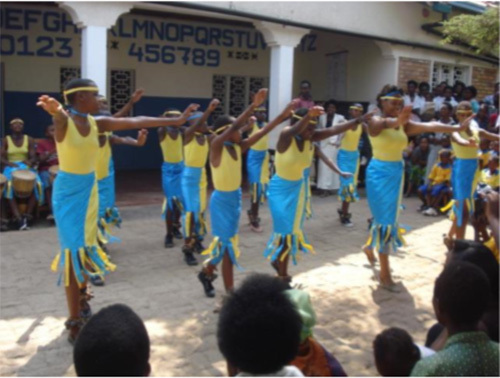 All the children performed songs and music they had been learning, the primary children did their traditional dancing with traditional costume – and drumming of course – children were praised for their hard work in school and all the children went home with a toothbrush. Some very kind sponsors in the UK have funded a new fridge/freezer for the school kitchen. Francoise, the cook, is delighted with it. She can now buy vegetables cheaply in the market and store them for the week. Food is very expensive here at the moment – due to too much sun (Readers in the UK will not believe it is possible to have too much!) So to stay “in budget”, Francoise must shop wisely in order to cook daily for around 100 children. We hope that you have enjoyed these highlights from August at Meg Foundation. Our visit there was so enjoyable and we are delighted to have made some more Rwandan friends at the project. Our thanks go to Meg for allowing us to visit and for trusting us to offer some input into this wonderful project.